Uma Thurman, Colin Firth, Jeffrey Dean Morgan, Sam Sheppard, Lindsay Sloan, Justina Machardo, Keir Dullea, Isabella Rossellini, Brooke Addams. Just when you are thinking that this is a 21st century variation on the screwball comedies of the 1930s, you read the publicity notes and find that this was what the director was thinking all time! This is familiar enough territory (actually it is a rather attractively scenic New York City) and the focus is on a strong minded woman. She is a radio counsellor on love and relationships and has the brashness of her convictions to dispense free advice even if it means the calling off of weddings and ruining people’s lives. Obviously, before the final credits she is going to learn to give up on abstract theorising and learn from experience. When she ruins a fireman’s life, his teenage hacker friend, sets up documents on the internet to show she is married to him. Since she is applying to marry her publisher, a series of screwball situations follows until the wedding day when she… But, to know you will have to see it, preferably on an undemanding but pleasant night out. The fireman lives above the Samosa Palace owned by a large Indian family which leads to meals, to a celebration that brings Bollywood to Manhattan as well as quite a number of Indian songs. Just that touch more exotic than usual. 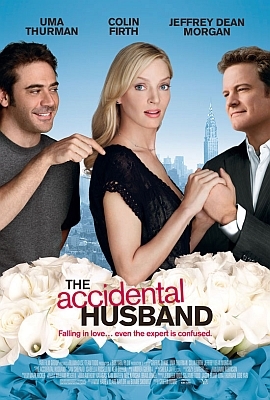 1.A pleasant 21st century romantic comedy, with echoes of the 30s screwball comedies? 2.New York settings, the use of the skyline, Manhattan, Queens, Astoria? Restaurants, radio studios, apartments? The score, the songs? 3.The title and its irony? 4.The introduction to Emma, her program on 'real love', her way of talking, the collage of her listeners, their devotion, in every walk of life, in every place? Patrick and his mates, the firemen, hearing his fiancée talk? Richard and his being the publisher, fiancé? Sophia, listening, calling in, everyone hearing, the advice to break the wedding, Patrick in the truck, pursuing Sophia (and the joke about the Korean storekeeper with his hands up)? His anger? Sophia and her shrugging off the engagement? 5.Emma, a woman of theory, self-assured, arrogant in her presentation, her advice? Her life, her engagement to Richard? Advertising her book, the celebrity status, the ads on the buses, her plans? 6.Patrick, the fireman, his living above the restaurant, his Indian friends? The introduction of Bollywood atmosphere, the restaurant, the family characters, food, the music, the celebration for Ajay? The final songs? 7.Ajay, his plan, computer geek, hacking, filling in the document? Emma and Richard at the office, the refusal of issuing the papers, the papers for the annulment? The address, the restaurant, Emma trying to find Patrick, the bar, playing pool, drinking, collapsing, being carried home? The night? Hurrying to the office, looking frazzled? Her father, her hard-mouthed assistant, Richard and the phone calls, her problems, going to the notary with Patrick, getting the documents, the explanation for Richard? 8.The cake-tasting, Patrick accompanying her, the women, Mrs Bollenbecker, her enthusiasm, talking to Emma? The explanations for Richard? Patrick and his success, coming to the dinner, having to pretend to be Richard? The discussions about soccer, Mr Bollenbecker, his plans to close down the firm, his change of heart? The dinner, Emma and the phone call about the accident, Patrick's arrival, their all going to the Indian restaurant, Ajay's celebration, singing and dancing? 9.Emma's father, the girl at the house, Emma's judgmental attitude, her father's advice, discovering his girlfriend, the truth, the catering for the wedding, her support? 10.Emma unsure, Richard to give her time? Meeting Patrick, the kiss in the lift and the surveillance, going home, the sexual encounter, the night? Seeing the notices in the rubbish, her anger? Going to see Richard, saying she was sure? 11.The radio program, Patrick ringing in, everybody hearing it? 12.The wedding, the ring, her being unsure, Richard and his graciousness? The water and the fire brigade coming, going off on the car? Richard and his withdrawing? 13.The radio program, Patrick present, her pregnancy? 14.The discussions about happy endings - and the happy ending for this film?